Here they are, stacked and drizzled with a bit of cream. Today is pancake day, so I decided to test out how to make banana pancakes using only bananas, eggs, blueberries, baking powder and a little oil (other ingredients optional), as inspired by BBC Good Food’s American Blueberry Pancakes recipe. For an easy-to-make banana pancakes recipe, there’s also one I found from Eugenie Kitchen (3-Ingredient Banana Pancakes) – I decided to stick closer to the BBC one in terms of the amount of baking powder used, and stirred in the blueberries while cooking as well. The basics are: take the following healthy looking stuff, mash and mix with some baking powder, then place the pancake mix in a flat frying pan and cook it for around 2 mins each side. 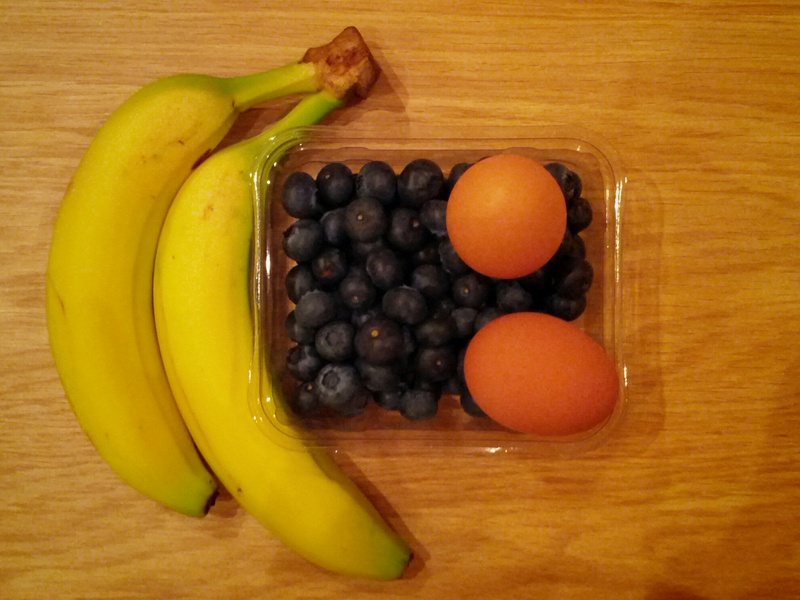 Serves 2, so you’re eating 1 banana, 1 egg and some blueberries. 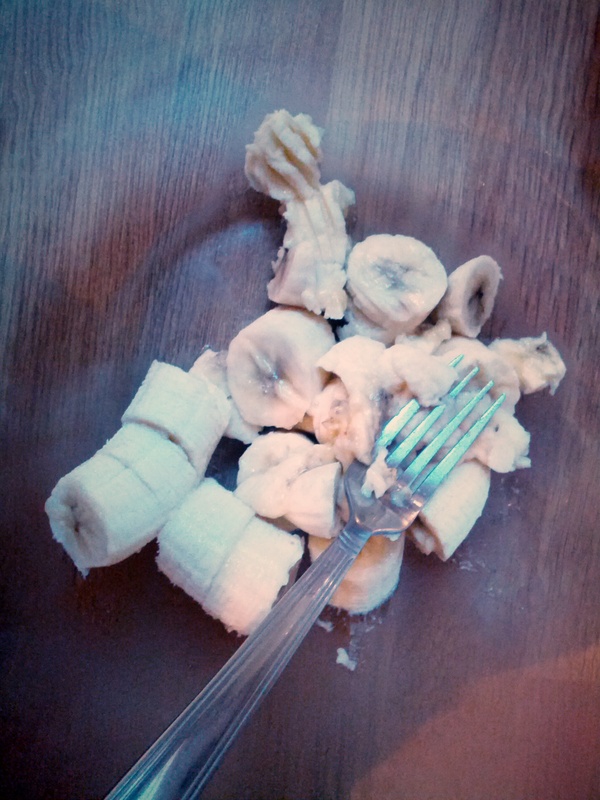 Step 1: Take your bananas, peel them, slice them and mash them (or use a blender/food processor if you have one). TIP: I bought some really raw bananas, so they are really hard to mash. You can mash these easily with a fork by placing the sliced bananas in the microwave. To soften, add 1 tsp of water in a bowl with the bananas, cover with cling film and microwave for around 30s. Keep checking the bananas every 10 additional seconds if you need to microwave yours for longer (if they are really raw). They should become slightly warm and very easy to squash with a fork (but don’t microwave them for so long that they become too hot or lead to time travel). Step 2: Mix in the baking powder and the (optional) vanilla extract and (optional) tiny dash of salt (just shake it once into the mix). Mixing with a rubber spatula is an easy way to “squash” the bananas further. 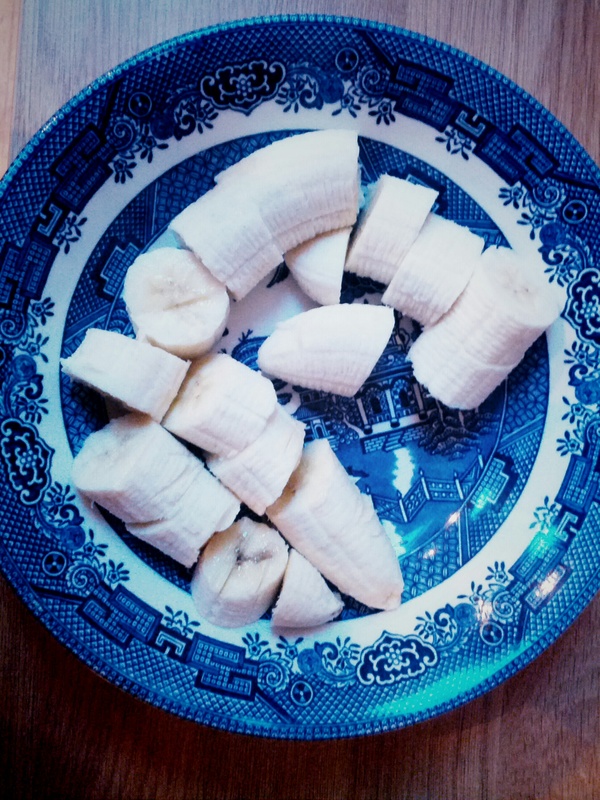 Switch to a bigger bowl (it helps with microwaved bananas to cool down), stir well, but don’t worry about any smaller lumps – they will “melt” once cooked. I did microwave the bananas to soften them, so decided to mix the baking powder in at this stage in order to help cool this down as well. The mix here needs to be reasonably cool before you add the eggs. 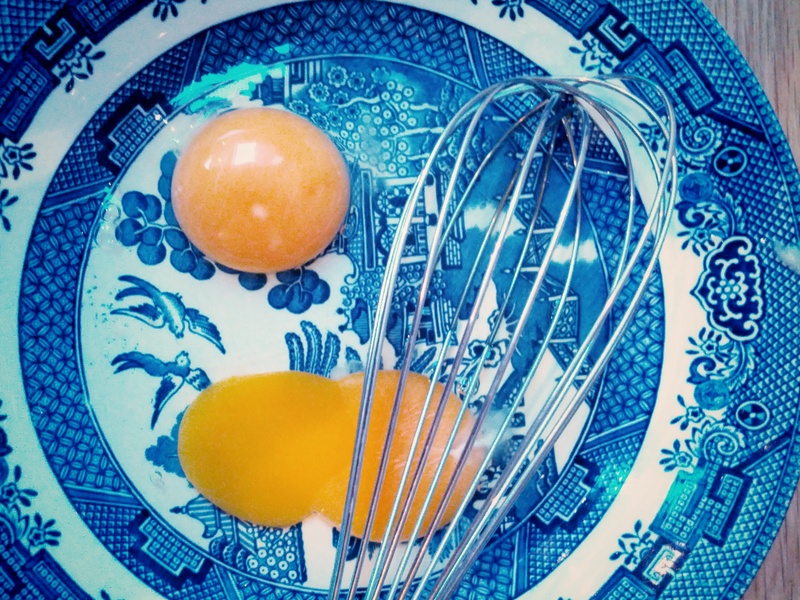 The baking powder is really important… Otherwise you’d end up with omelettes. 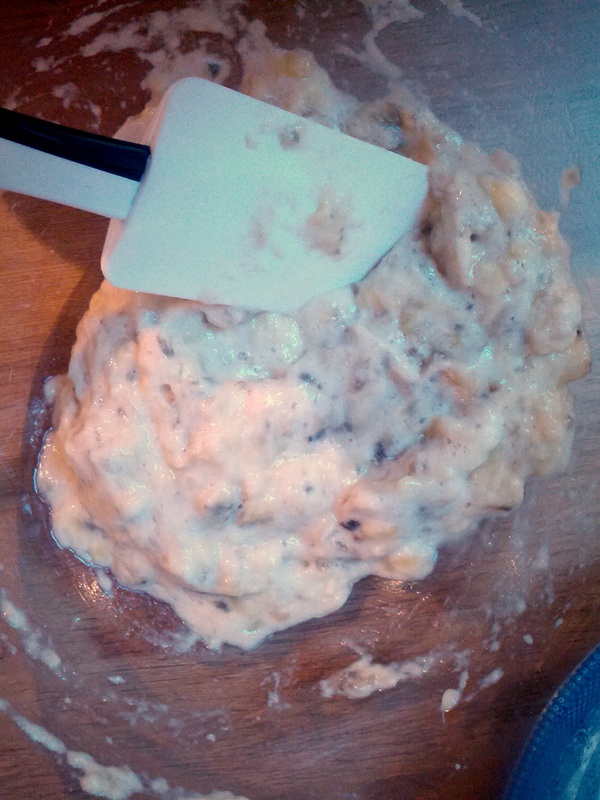 Step 3: Take those eggs, whisk them and add them to the banana mix. Stir well. If you didn’t microwave the bananas, then you can also add the baking powder to the egg mix and whisk instead. 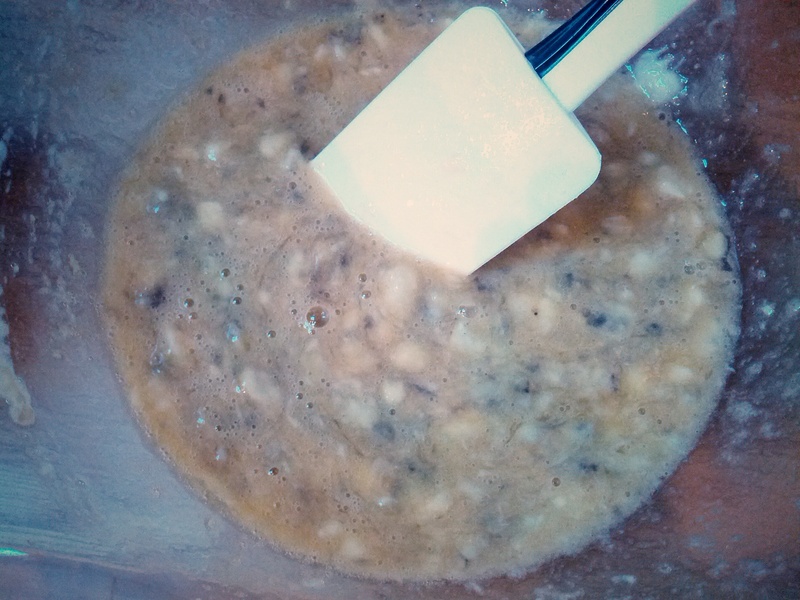 Once the eggs are whisked, the banana mix will have cooled down enough to add those eggs. Keep stirring until you get the pancake mix. The consistency will be running but slightly thick, similar to what you’d expect with normal pancake mix. This is what the consistency looks like, and once again, don’t worry about small banana lumps. 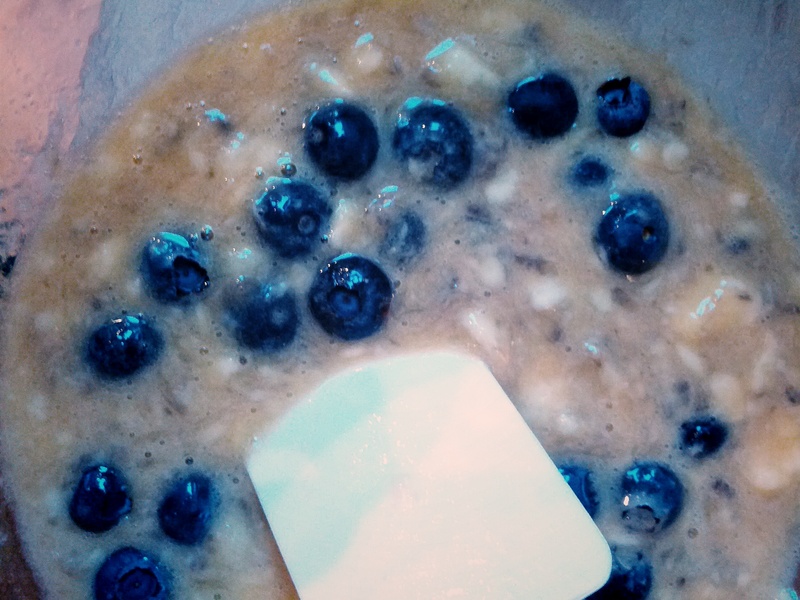 Step 4: Add in around half of the blueberries, and keep stirring. The rest if the blueberries will be to throw over the pancakes when serving. 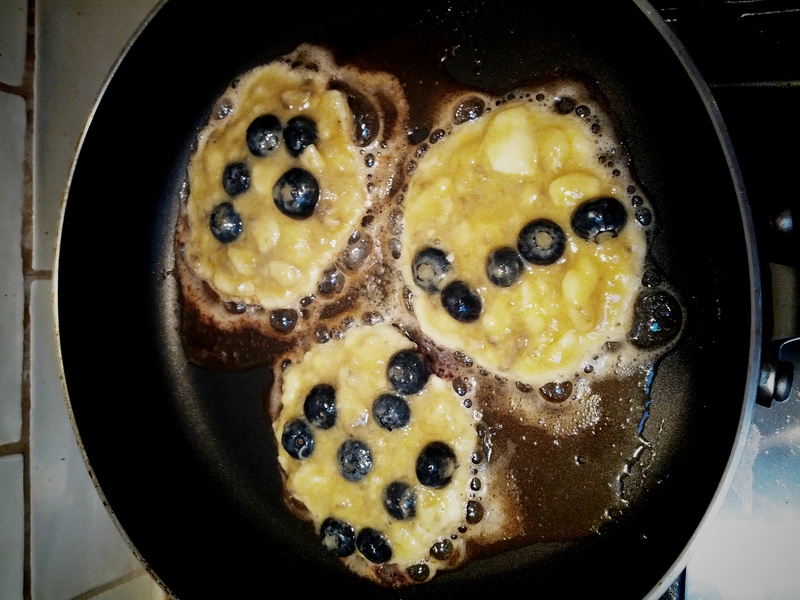 Add in enough blueberries so that there are always 3+ in each tbsp of pancake mix. Step 5: Add oil to the frying pan, drop in 2 tbsps of pancake mix, cook for 2 mins on each side. An average frying pan should be able to cook around 3-4 pancakes at once, and 4 serves one person here. I decided to use butter instead of oil because there was a tub that needed using up, and I love the smell of frying butter. If you need a banana recipe that doesn’t contain milk, use vegetable oil. Also, as it’s fried with butter, the colour of the pancakes are a bit darker in the end result. Step 6: Stack the pancakes and serve with the rest of the blueberries. Optional additions when serving includes syrup and cream. As these are made of bananas, they are already naturally sweet, so I drizzled a tiny bit of single cream on there. It’s completely fine without though. 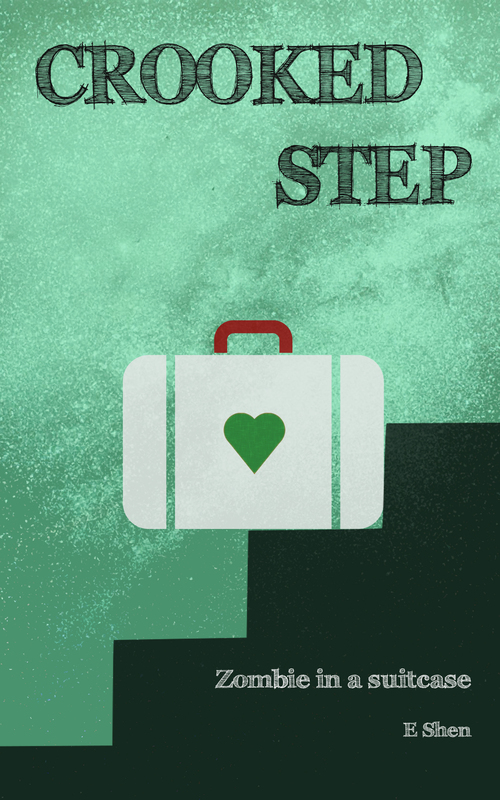 And as an aside, I’ve taken a bit of a break from this blog and website to sort out some other stuff, but should be back here pretty regularly come March. For now, happy pancake day! Breakfast food is the best food! And do you have any favourite pancake recipes?